"Astronomers are used to large numbers, but few are as large as the odds I'd have given this celebration today," is how Astronomer Royal Martin Rees started his presentation at Stephen Hawking's birthday symposium yesterday. He was talking about the 1960s when he first met Hawking who was then already suffering motor neurone disease. But Rees' prediction has been proved wrong. Hawking turned 70 yesterday and since the time of their first meeting he has made enormous contributions to cosmology and physics. 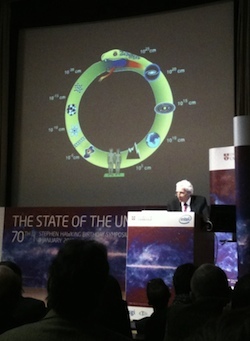 Martin Rees explaining the interconnectedness of the microworld and cosmos. Yesterday's programme was impressive. Rees' talk was a dizzying journey through cosmology, starting with Earth-like planets orbiting far-away stars and ending with the multiverse. Nobel laureate Saul Perlmutter drew as much laughter as amazement, exploring how he and other experimentalists discovered that the Universe is expanding at an ever accelerating rate, setting us on course for a big freeze. Kip Thorne, who has been at the forefront of black hole research since its inception, took us on a terrifying journey into these gravitational monsters and the spacetime ripples caused by them. We will publish Rees' lecture on Plus very soon. See the reading list below for more on the contents of Perlmutter and Thorne's talk. The only disappointment of the day was the absence of its protagonist — Stephen Hawking was unable to attend due to ill health. We did get to listen to a pre-recorded version of his presentation, however, and we will publish parts of it on Plus soon. The day ended with tumultuous applause and a standing ovation for the most iconic scientist of his generation. It was definitely one of the most touching, funny and fascinating scientific events we've ever attended and we've tried to capture some of the atmosphere for you. So if you weren't one of the lucky few who managed to get hold of a ticket, listen to our podcast in which we talk to Martin Rees, some of Hawking's ex-students, his graduate assistant, as well as members of the audience. Listen to our podcast from Stephen Hawking's birthday symposium. For topics covered in Kip Thorne's talk read Catching waves with Kip Thorne. Read our interview with one of the speakers at the scientific conference, Renata Kallosh, in Supergravity to the rescue? 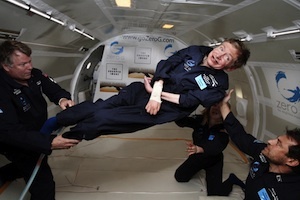 You can read an excerpt of Stephen Hawking's lecture here. Stand by for Martin Rees' talk, as we will publish it on Plus very soon.